Chattanooga Choo Choo: Enter the convention center under the largest unsupported brick arch in the world. With an 82 foot high ceiling dome and skylight, this is one of the coolest sites to see in Chattanooga. Your group will marvel at the historic Terminal Station and home of the Chattanooga Choo Choo Train. Lookout Mountain: Located on the Southernmost end of the Cumberland Plateau, Lookout Mountain is home to Ruby Falls underground waterfall and Rock City which includes several tourist attractions and restaurants as well as the famous Lookout Mountain Incline Railway that runs one mile straight up the mountainside. This is a beautiful visit that will be very exciting for your group. Ruby Falls: Ready for a beautiful and awesome natural wonder? Ruby Falls delivers with a 145 foot high waterfall that is located underground inside of Lookout Mountain. Your group can tour the waterfall and have lunch here at a restaurant located on site. 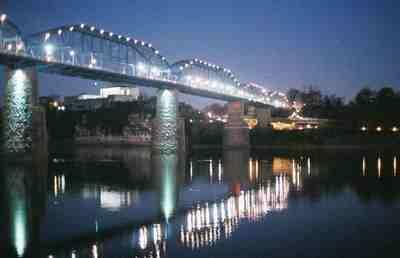 Confederate Historical Sites: You can’t visit Chattanooga without feeling a little bit of Civil War History. Being a hub of many of the battles of the war, Chattanooga has several different historical locations that your group can check out on their visit. From nature lovers to historians, this place has something for all! Other Activities: Looking for more activities, your group can spend some free time in the beautiful Coolidge Park or they can tour the awesome Tennessee Aquarium which includes an IMAX film, an explorer cruise and lunch. There is also a glass bottom boat ride that can be taken in a cave at Lost Sea Adventure. If you’re needing a quick and cheap meal, we can get you a dinner at Cici’s of all-you-can-eat pizza. Chattanooga is a unique and fun place that is sure to give all of your group members a great time!